This solution combines QStar Archive Manager Software with the DISC ArXtor Appliance to provide hospitals, imaging centers and clinics with a secure active archive solution that ensures radiologists and other healthcare professionals have access to the patient data they need to provide quality patient care. It delivers a flexible archive solution that provides cost-saving long-term storage efficiency, optimum scalability and robust features that can manage the growth and changes needed to meet stringent patient data retention and protection requirements. QStar Archive Manager creates an Active Archive by virtualizing the DISC ArXtor Appliance, presenting the archive as a network share using industry standard CIFS or NFS protocols. Healthcare professionals can easily search and retrieve patient data directly from the archive. Even offline media is efficiently tracked for simple retrieval. 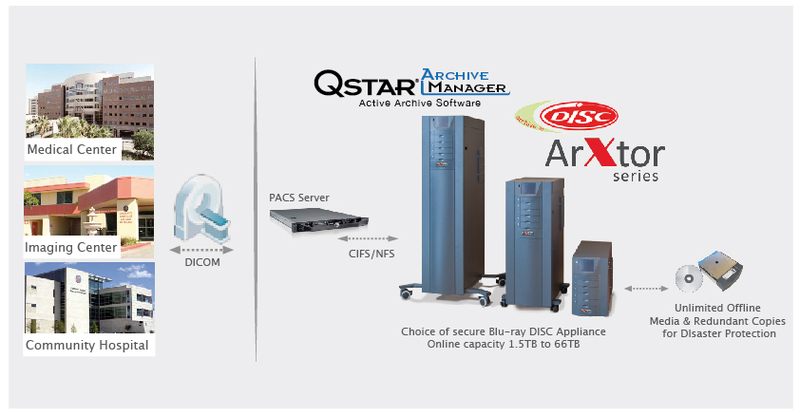 The DISC Archiving Systems’ ArXtor Appliance is a Blu-ray optical archiving solution which provides for the centralized Write-Once storage of PACS images and RIS data for long-term compliant archival storage and retrieval. The integrated server eliminates the need for additional storage management hardware and with the QStar Archive Manager software it facilitates transparent integration, support and network connectivity to all PACS/RIS clients over a GigE LAN with no local client agents required. The ArXtor Appliance also integrates and supports hot swappable redundant hard disk storage for archive cache and overall application scalability.The ArXtor’s intelligent touch-panel display and web-based GUI provide simple yet powerful library configuration and administration capabilities, both locally and via the network (Java). DISC’s patented SmartPack removable media technology facilitates quick “hands free” bulk media import/export while enabling robust bare media security for off-line media handling and infinite off-line media storage. The DISC ArXtor Appliance Series offers a range of frame sizes and capacities, available in rack-mount and free-standing pedestal configurations.